A few years ago we had the pleasure of going to a wedding in Southern Germany. It was the best wedding we have attended, set in a beautiful church in a German village with a reception in a castle in the Black Forrest surrounded by vineyards. Complete with amazing food, great company and dancing into the wee hours of the morning. The night before we ate in a little country pub and I had a pork and noodle dish I have been craving it ever since! This was my first German/ Swiss meal has anyone else got any recipes to share would love to learn more, or know or any German food bloggers! 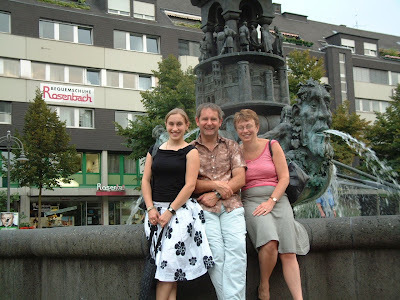 Heres a snap I found from the Germany trip in 2005!, after the wedding my parents flew from Scotland to meet us for the weekend, we also had hubby's parents with us we flew them over from India and drove them all over Southern Germany he he they were so tired trying to keep up with us. Wow time fly's I am now a Mum, next time we visit will be with Jasmine!